All INTAGENT products come with the ability to connect into your social media accounts. If you are new to social media and would like assistance getting up to speed we offer an affordable setup with our professional designers. You can look like a pro in no time with our social media assistance! For a one time charge of $149.95 our professional designers can create a social media brand catered to your unique look and feel for your business. We will set you up on Google+ and Facebook® providing you with a well branded page for all your business needs. This will include a background image to match your Intagent website and professional homepage photo. 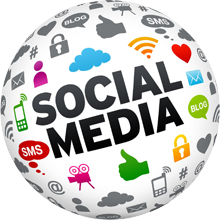 Our staff will then guide you to the relevent areas on how to get started on social media marketing! Would you like someone to do your daily blogging and social media work? Maybe edit your website as well? We all understand that creating a social media presence can take time and patience. If you are a busy real estate professional and want someone to take care of social media for you, we offer packages starting at just $199/month with our Virtual Assistance Team! Let INTAGENT build you a solid Social Media presence built specifically to your own unique style and brand at a competitive low price! There are many things that makeup the Intagent real estate website platform. We are here as your partner to be your single source for real estate online marketing. Whether that's getting new leads, showing off listings, or anything in between, we've got you covered! Here are some key features that we believe stand out for real estate agents like you!